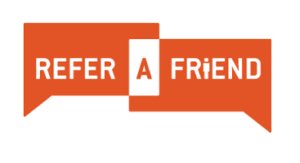 Our refer a friend scheme is a way of saying “thank you” and giving you a little extra for being a supporter of Readings. If you’ve had a fantastic experience working with us, you’ll want your friends and family to have the same level of service too. If you know of anyone that has a property matter and you think that we can help, mention us and you could both be rewarded with up to £100 cashback! Easy peasy! For each referral you make to us you earn a reward. Simply provide us with your friend’s name and contact details in the form below or call us (whichever you prefer) and we’ll be happy to follow up and take care of them. For a property sale, you earn £100, for a lettings property you earn £50 and for one of our professional surveys and/or valuations you earn £25. Once your friend completes their property matter with us, you’ll both be paid. There’s no limit! Earn every time you send a referral our way. Simply complete the form below to refer your friend and we’ll be happy to help them. Thank you to all of our current & future clients.